If you had the money, late Georgian shops were awash with tempting goods. And even if you weren’t so well off, tradesmen would extend credit for considerable periods if your name was good, you were a prominent person or your expectations were favourable. Many a Regency rakehell kept buying on tick for years, dangling the prospect of an inherited estate or a forthcoming marriage settlement before his unfortunate tailor or wine merchant. No-one enjoys receiving bills, but distance lends enchantment as far as 18th and 19th century invoices are concerned and we can enjoy them for the insight they throw on shopping habits and prices and the pleasure of their ornate headers. 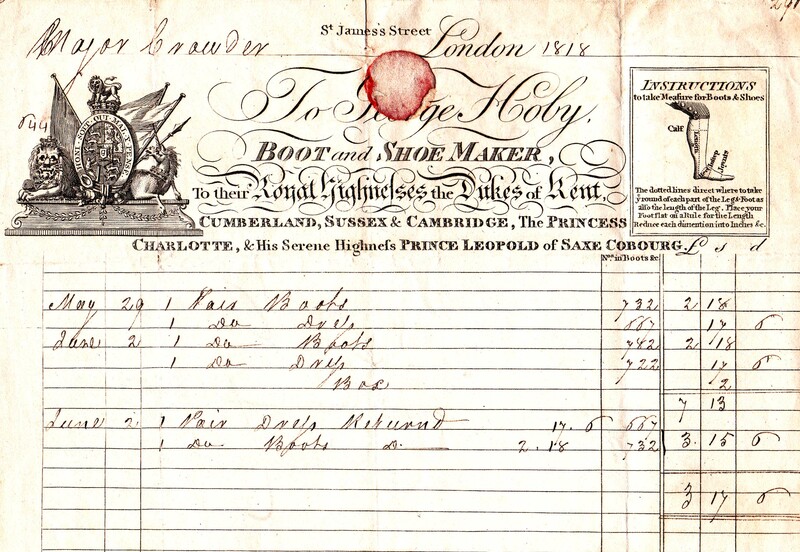 The example at the top of the page is from Hoby, the iconic bootmakers of St James’s Street, to Major Crowder, the officer who captured the carriage with Napoleon’s codes in it during the Peninsula War. It is dated June 1818 and the major had received four pairs of boots and returned two, leaving him with £3 17s 6d to pay. A note on the back says that he did pay it, but does not give a date. Presumably the two pairs came back because he had not measured carefully enough, even with the help of the diagram at the top of the page. The red marks on many of these bills is from the sealing wax used to close them when they were folded up for delivery. 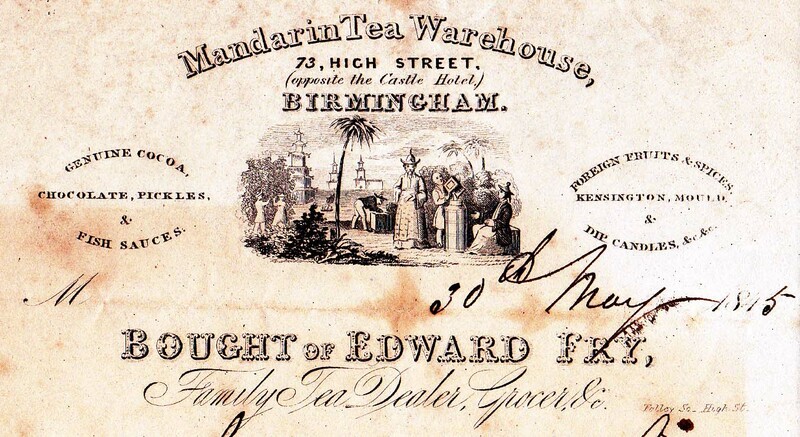 The next bill is from a Birmingham merchant, not a London one, but I couldn’t resist the picture of the Chinese tea merchants loading up tea crates with a background of pagodas. It is also from 1815, a time before the East India Company had begun growing tea in India, so all tea drunk in Britain was China tea. and the purchaser of the goods. Richard Frampton was a “Grocer, Tea Dealer and Oil-Man” and also ran a “Two-Penny Post Office”. His shop was in Shepherds Market, the original site of the May Fair that gives the Mayfair area its name today. 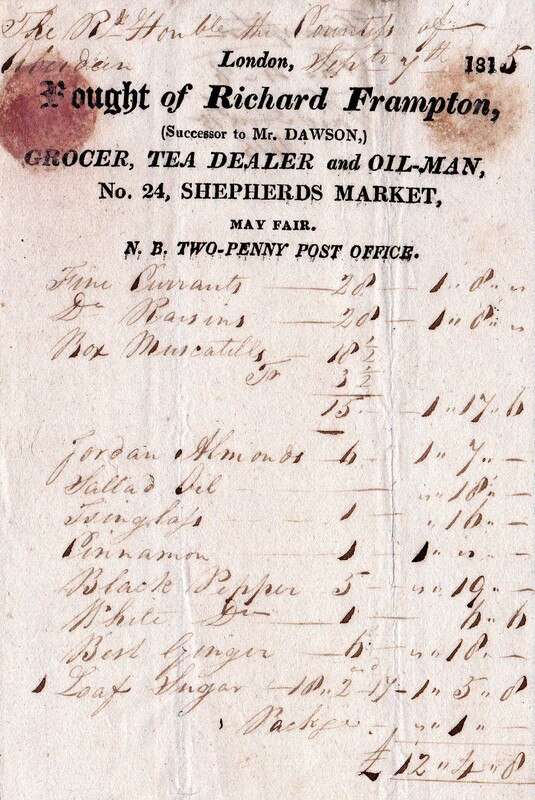 Shepherds Market now is the lcoation of numerous interesting eateries, but in 1815 was still very much a place to buy essential provisions. Mr Frampton had sold currants, raisins, almonds and spices to the household of the Countess of Fife and submitted his bill for £12 4s 6d on 7th September 1815. He had to wait until August 15th 1816 to be paid. The bill below is a particularly nice one, because not only does it have the royal warrent of His Royal Highness the Prince of Wales and a handsome crest of the Prince of Wales’s feathers, but the business was owned by a woman, Margaret Masterman. 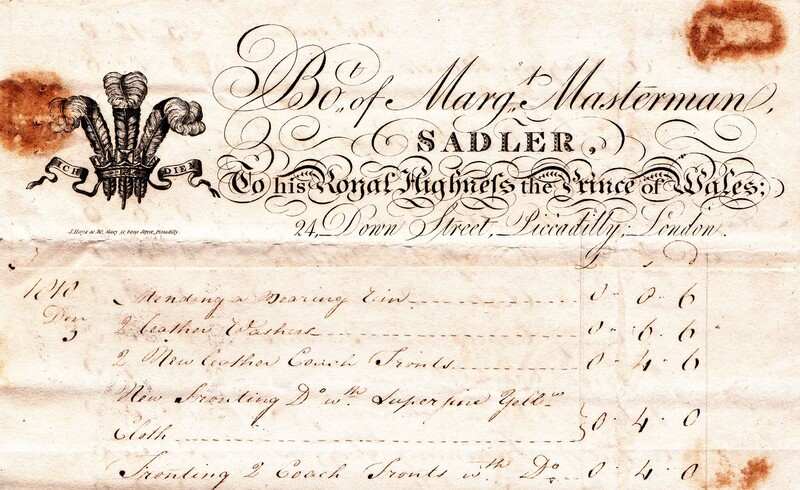 Margaret ran her sadlery business from Down Street, off Piccadilly, and submitted a very long account, covering the period December 1810 to May 1811 and amounting to £24 15s 0d. It was paid by John Kitson in June 1811. Mrs Masterman had repaired harness – “Mending a bearing rein 6d”, “repairing a coach bridle 1s 6d”; provided grooming equipment – “One mane comb 6d”; supplied new saddlery – “Two best Hogskin seated footmen’s saddles £7 7s 0d”and general cleaning equipment for carriages – “A large coach sponge 7s 0d”. 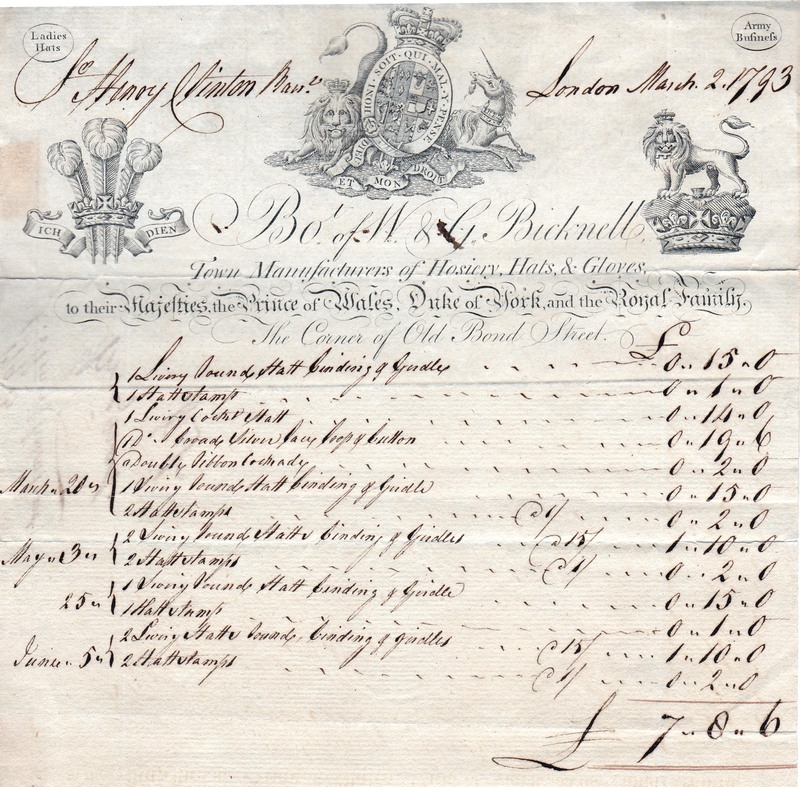 My final invoice is from W & G Bicknell, “Town Manufacturers of Hosiery, Hats and Gloves to their Majesties the Prince of Wales, Duke of York and the Royal Family.” Bicknells’ was located in Old Bond Street and they sent this account to Sir Henry Clinton, bart. 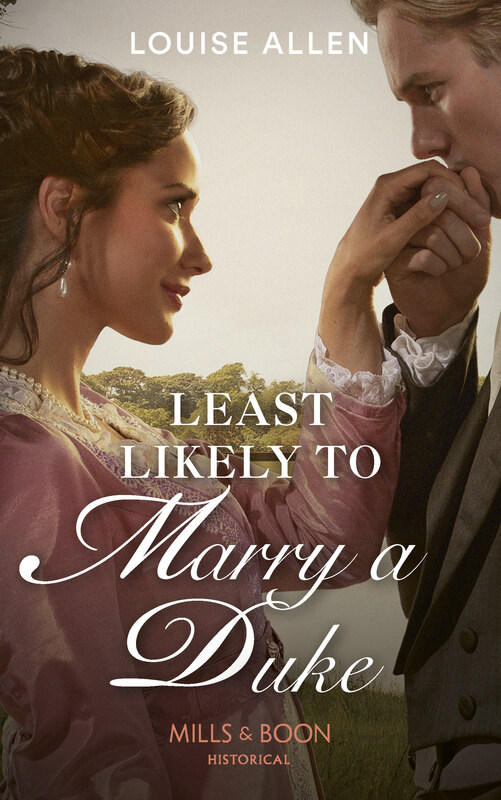 in March 1793. He paid it June that year. The handwriting is very difficult to read but Sir Henry was buying ornate livery for his footmen, to a total of £7 8s 6d. Would it make it any less painful to pay the credit card bills if they came handwritten, with ornate designs at the top? I suspect they would be just as unpleasant., although one of the great advatages of these bills is that there doesn’t appear to be any interest charged, however late the payment!